I will admit that I have never read the original Frankenstein. I know, it's embarrassing, but I've seen and read enough retellings that I feel like I have an okay grasp on the story. Even if I didn't, I absolutely would have picked up this book as soon as humanly possible because I am obsessed with everything Kiersten White writes after falling in love with And I Darken. This Frankenstein retelling focuses on Elizabeth, a young orphan who is taken in by Victor Frankenstein's family in order to befriend him and keep him out of trouble. Elizabeth does whatever she can throughout the story to make herself useful and irreplaceable in the Frankenstein household. I found Elizabeth to be a character who was morally gray and extremely interesting. I wouldn't go so far as to say that I loved her, but I was definitely intrigued by her motives and sympathized with her fierce need to belong. Victor Frankenstein is about what you would expect. He's passionate and dark and and a bit terrifying. He has a very intense desire to conquer death, which leads to some extremely questionable, horrific actions. Elizabeth and Victor together were all kinds of disturbing and this book makes no effort to hide it. Although it's clear that they love each other, it is definitely in a very unusual and possibly toxic way. I still found myself rooting for them, at least for part of the time. There were other characters along this journey who were all fantastic and Frankenstein's Monster was fantastic! I thought the writing was beautiful and the world was atmospheric. The story was interesting and different enough from any other I've read to keep me intrigued. All that said, there was one big issue I had with this book and that was the pacing in the first 60% of it. In And I Darken, a very large chunk of the book was devoted to telling you how the characters became who they were. Because that book was nearly 500 pages long and part of a trilogy, it worked for me. Something very similar happened in this book, but Elizabeth Frankenstein is 300 pages long and a standalone, which made getting through the first 200 pages incredibly tedious. Had this book been by an author I didn't know I loved, I would have given up on it. Luckily, the last third made up for it and presented an incredible story. If you happen to love character driven books, you'll probably love it start to finish! The ending of this book is very different than the ending of the original Frankenstein, which is perfectly alright with me since this is a retelling. I really enjoyed the ending and would love to see what happens next! 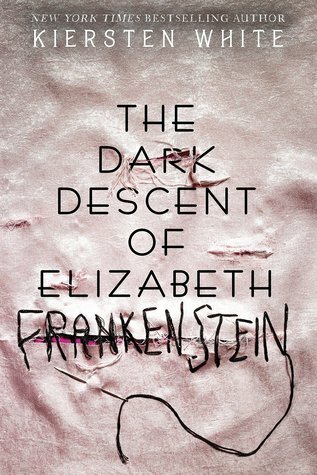 The Dark Descent of Elizabeth Frankenstein is a unique take on a story that has been told a million times. If you're a fan of the Frankenstein story or gothic horror in general, I would recommend this.